This Demonstration further explores ambiguous rings. An ambiguous ring is a three-dimensional space curve or set of space curves that can be viewed as a circle, a heart curve, a shape like a lemniscate or the letter S, depending on the viewpoint. Such a ring or ring set can be defined as the intersection curve of a circular cylinder and a generalized cylinder over a heart curve such that the two cylinders cross at a right angle. You can vary the radius and axial offset of and the axial rotation of . For each case, closed curves are possible when 's cross section fits exactly inside ; click "A" or "B" for the two solutions. A single ring with the same view properties (circle or heart) can be generated using "single ring cutoff angles" sliders and to control the range of the angular parameter in the parametric equation of the full ring set. To find the intersection, we put the corresponding coordinates equal to get three equations in four unknowns: . Eliminating , and by solving the equations gives the parametric curve of the intersection, with as the only parameter. This composite curve (ring set) can be split into two rings. Therefore, the parameter range for , from to , is divided into sections using the cutoff angles and . E. W. Weisstein. 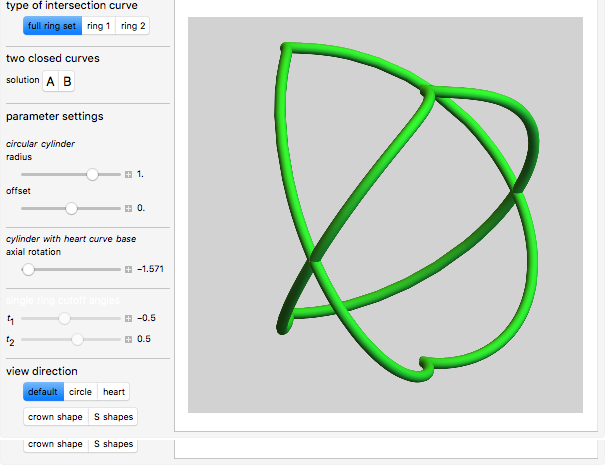 "Heart Curve" from MathWorld—A Wolfram Web Resource. mathworld.wolfram.com/HeartCurve.html (Wolfram MathWorld). Erik Mahieu "4. Ambiguous Rings Based on a Heart Curve"